Ten years ago: the jeepocalypse. 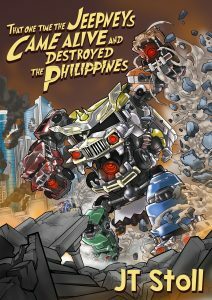 That day, the vehicles of the Philippines combined into the monsters known as jeeplords: mindless, invincible, and angry. Their fury leveled the nation, leaving a wasteland of poverty and famine. Noli—a motorcycle driver for hire—has spent the last ten years running for his life. The jeeplords have a special grudge for him, and to stay anywhere for long is suicide. However, he will soon discover that not only can he survive the jeeplords, but he may hold the key to ending their reign. That One Time the Jeepneys Came Alive and Destroyed the Philippines is a dreadfully serious post-apocalyptic novella—devoid of any humor—about what happens when public transportation comes alive in a bloodthirsty rage and won’t take “no parking” for an answer. You can read a preview of chapter 1 right here. The reviews are in…this book rocks!